Cade Shepard claims NCHA Eastern Nationals Non-Pro championship. Cade Shepard on Chexy Louella. Seth Petit Photography. 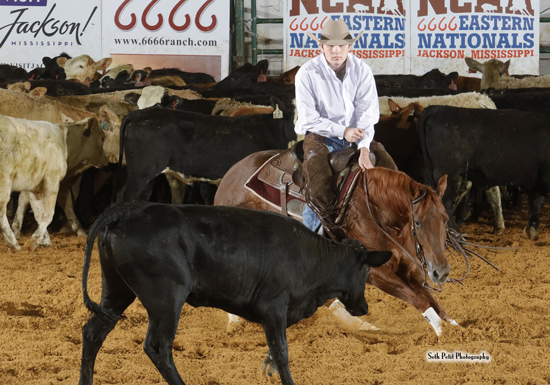 The NCHA Eastern National Championships concluded in Jackson, Miss., on Friday, March 15, with the Non-Pro Finals, won by Cade Shepard with 222 points on Chexy Louella, the mare Shepard also showed to win the 2018 NCHA Futurity Non-Pro championship. Eight years ago, Cade Shepard, Summerdale, Ala., was named the 2011 NCHA Junior Youth Rookie of the Year. In 2016, he was inducted into the NCHA Non-Pro Hall of Fame, and currently has NCHA earnings of over $786,000. In addition to the NCHA Futurity win, his impressive list of Non-Pro championships, some of which he has won multiple times, and in both 4 and 5/6-year-old divisions, includes the NCHA Super Stakes, the NCHA Derby, the PCCHA Derby, the Ike Hamilton Futurity, the Southern Futurity, the Cotton Stakes, the Augusta Futurity, and the Breeders Invitational. Cade’s mount, Chexy Louella LTE $59,721, by Im Countin Checks, was bred by Oxbow Ranch and is the first money earner out of Louellas Cat LTE $302,483, by High Brow Cat, and a full sister to Cattalou $306,149, winner of the 2014 Breeders Invitational Open. Chexy Louella was a $30,000 purchase as a yearling at the Western Bloodstock NCHA Futurity Sales. Blake Graham on Legal Dream. Seth Petit Photography. Blake Graham, Rockledge, Ga., earned the NCHA Eastern Nationals Non-Pro reserve championship with 217.5 points riding Legal Dream, while Colt Moore, Williston, Fla., placed third with 217 points aboard Catscratch Sister. Blake Graham was Amateur reserve champion of the 2016 NCHA Futurity on Zacks Smoothie, and also showed the Smooth As A Cat daughter to win the 2017 Augusta Amateur Unlimited Futurity. He showed Legal Dream in 2017, as well, to take win the NCHA Eastern Nationals Non-Pro reserve championship. Fourteen-year-old Legal Dream LTE $181,028, by Dual Rey, has carried Graham as a finalist in 11 divisions of the Eastern Nationals, over four years, including in 2015, when Graham was Junior Youth reserve champion. 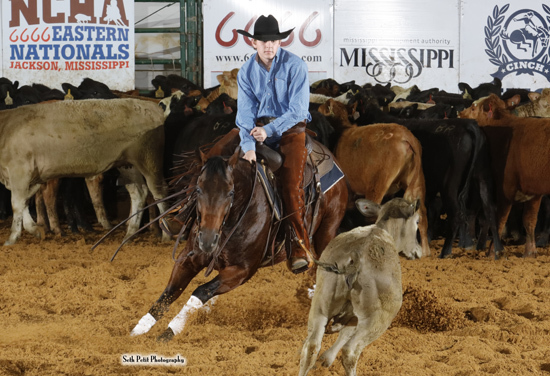 Colt Moore, Williston, Fla., third- placed with 217 points aboard Catscratch Sister LTE $132,187, won the Eastern Nationals Senior Youth championship, last weekend, riding the 10-year-old WR This Cats Smart daughter. Moore and Catscratch Sister also claimed the 2016 Senior Youth championship. Moore, the 2009 NCHA Junior Youth Rookie of the Year, is the NCHA earner of $74,297. He won the 2015 Eastern Nationals riding Highwood Dancer LTE $74,122, and placed third in the same division last year on Catscratch Sister.